The Conroy family have been in the business of growing the finest Irish raspberries ever since Annie set her first canes over 40 years ago. Today their harvest of rich and fruity berries are grown on specially chosen plants. Punnets of raspberries are available hand picked each day for freshness and quality. 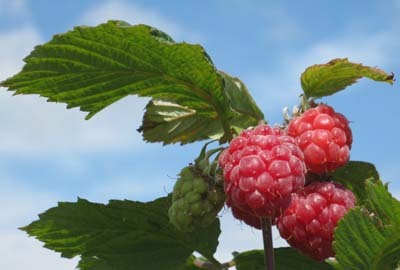 From late June to early August our raspberries are available for purchase direct from the farm. We also sell frozen raspberries and make our very own delicious Raspberry Jam which is on sale throughout the Raspberry season. Conroy's Wicklow Raspberries are supplied to a number of local stores in the north Wicklow and south Dublin area. We are happy to handle larger orders for individuals and groups catering for parties and special events.